Essential Solutions School of Complementary Therapies is based in Kimberley, Nottingham. The training centre is run by Caroline Bradley who has been teaching complementary therapies in local FE colleges since 2005. 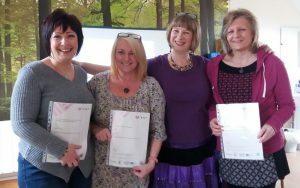 Providing a hub for all things holistic and Complementary Therapy training in the Nottingham area, Essential Solutions offers a variety of courses, from taster to practitioner level qualifications. ‘As funding becomes ‘squeezed’ in the FE sector, fewer and fewer courses for personal development are available,’ said Caroline, ‘and with an increasing public interest and awareness of our health and well-being the time seemed right to open such a venture’. 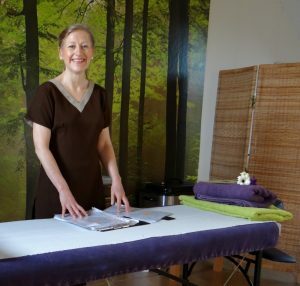 Caroline teaches a range of courses including Aromatherapy, Body Massage, Reflexology, Indian Head Massage, Thermal Auricular Therapy and Anatomy, Physiology and Pathology. Looking for a change of direction? Three students receiving their VTCT Diploma in Reflexology certificates from visiting foot reader Jane Sheehan. Take a look at our complementary therapy qualifications? Already qualified? We have a range of CPD courses . If you are interested in a finding out more about complementary therapies, join Caroline on one of our taster courses. Here you’ll meet like-minded people and further your knowledge of holistic health. Read feedback from some of our students. Error: Error validating access token: Session has expired on Monday, 15-Apr-19 01:34:43 PDT. The current time is Tuesday, 23-Apr-19 19:48:09 PDT. We are located on the second floor, above Mad Hatter's Tea Room.